Together, we will wow guests & save water! 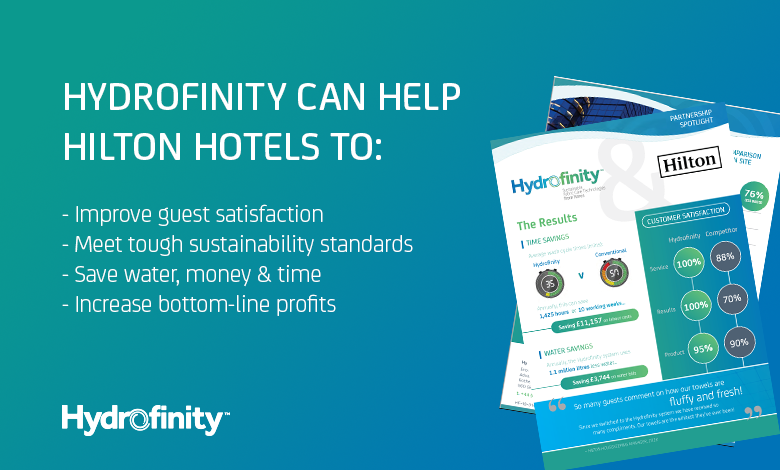 Hydrofinity are helping Hilton properties across the globe exceed their brand values. Hydrofinity are approved suppliers to Hilton Americas. This means all Hilton properties, whether they are owned, managed, or franchised, can buy from us with ease. Hydrofinity understands that cleanliness is critical when it comes to protecting the Hilton brand. Cleanliness impacts your guests’ experience and their loyalty, so it is crucial to consistently deliver a clean, fresh first impression. We know how important high SALT scores are to your brand too. The Hydrofinity system can make linens and towels cleaner, brighter, and softer than anyone else. We know you have a commitment to the environment. Over the past decade, the Hilton group has reduced energy use by 14.5%, carbon output by 20.9%, waste output by 27.6%, and water use by 14.1%. Hydrofinity can help you achieve further savings with the most sustainable washing solution on the market. We are confident that we can improve your guests’ experience and help increase your bottom-line, no matter what your current laundry set-up is. To read our Partnership Spotlight and Customer Case Study, just fill in the form!